Posted on October 13, 2015 by Matt Frazier / This entry was posted in Informative, Product Reviews and tagged firefly, firefly vaporizer, herbal, herbal vaporizer, vape, vaporizer. Bookmark the permalink. A convection vaporizer allows your herb to be heated with hot air, and makes for one of the best herbal vaporizing options available. 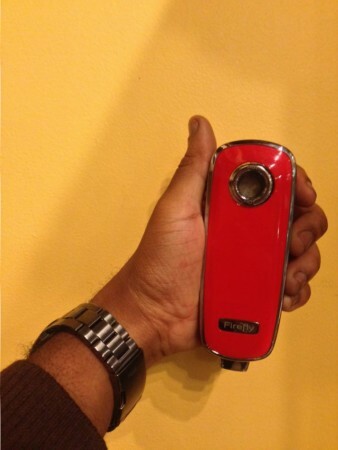 The Firefly vaporizer utilizes this style of heating, providing a clear smoke, with limited issues on smell or portability! It is a larger size vaporizer, similar in size to other herbal vaporizer options we have at the shop including the DaVinci and Ascent. The sturdiness on the Firefly Vaporizer can be felt almost immediately, and the design is also very sleek, combining simplicity with heavy duty efficiency! 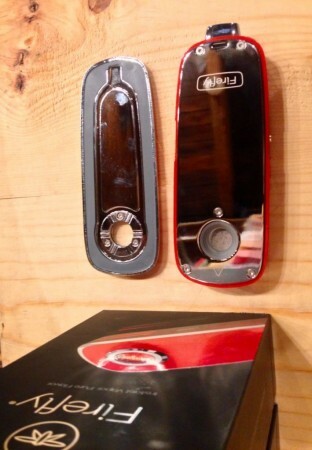 To open the Firefly, simply lift the magnetic cover and access the herb chamber (picture below)! The “locking” mechanism ensures this piece will not slip as you enjoy a bowl. As with most herbal vaporizers, preparing finely ground herbs is important for allowing air to flow easily through to the mouthpiece below, where you’ll enjoy a hit that is powerful, but clear. A transparent glass cover allows the user to see when their product is reaching the near end of rotation. Don’t forget to grab an Octopus Glass Jar to store the leftovers for later use. As you slowly pull, the power remains in YOUR hands as to how dense the smoke will be when inhaled! Although the Firefly weighs in as the heaviest of our herbal vaporizer options, the size remains easily portable, resting comfortably in your palm. Once your bowl is done, the discreteness presents a myriad of options for putting away – stash in your pocket, or away on a shelf. It comes in vibrant red or smoky black. Fans of slimmer or pen-style vaporizers can still choose from our selection which includes the brand new PAX 2 and the Atmos Orbit! A removable battery presents the option to stock up on batteries, keeping your charges going above and beyond and helping provide an excellent quality vapor. Long lasting power keeps you puffing all through the day, giving you that extra boost when you need it most. When unboxing the Firefly Vaporizer, you’ll find all the instructions you need to get started in a concise, fast to read manual, as well as a detailed guide to selecting the ideal temperature for your bowl. This vaporizer, like many of our others, allows you to easily switch the intensity of the heat for optimal smoking, meaning that you can get the most out of your herb while providing an optimal vaping experience to all types of vapers.